(MENAFN - Daily Outlook Afghanistan) KABUL - Chief Executive Officer (CEO) Dr. Abdullah Abdullah on Monday said that Taliban were still an obstacle to the peace process, using the effort as an instrument. 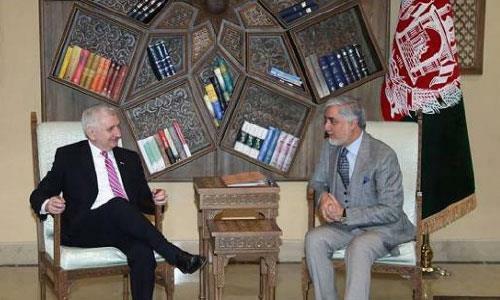 A statement from his office said Dr. Abdullah made the remarks at a meeting with a congress delegation. NATO's Resolute Support Commander Gen. Austin Scott Miller and US Ambassador John Bass were also presence. The statement added the CEO appreciated US peace efforts, commitments and support to Afghanistan. He also presented his interlocutors a clear picture of the security situation in the region. The presidential election should be held on schedule in September in a transparent way to strengthen the democratic process in country, the chief executive officer opined,. Abdullah supported Special Representative Zalmay Khalilzad's efforts to end the conflict in Afghanistan. He hoped the ongoing peace negotiations would facilitate an intra-Afghan dialogue. Regarding the Taliban's spring offensive; Abdullah said the militants were still a hurdle to the peace process. The Taliban continued to use the peace process as a tool and they were committed to ending the war. Abdullah asked the US to mount pressure on Pakistan to support genuinely the peace process, saying the neighbouring country continued to have influence over the rebel movement..